A Resident Evil title was originally rumored as far back as 1997 for the Nintendo 64, first planned as "Resident Evil with Ninjas," according to interviews with various Capcom heads during that year, it seems the idea became split... turning half of the concept into "Resident Evil with Samurai" and eventually becoming Onimusha, while the concept of a Resident Evil title on the Nintendo console remained. While rumors of a games release persisted however it wasn't until late 1999, around the time of the Tokyo Games Show, that the game was officially announced. Rebecca Chambers returning in a prequel to the first game. Sure it didn't make much sense, but that's the way it was. Step one of the catch up plans for those with the Nintendo 64 was by allowing them to get an idea of the story surrounding the title. And so Resident Evil 2 was released on the Nintendo 64 by Angel Studios. Apart from including some things people thought they'd never see on Nintendo 64 (it contained compressed FMV along with it's full voice track, as well as the largest cart the console saw), it also included numerous files matching up with Resident Evil, Resident Evil 3, Code Veronica, and ones to tie into the 64 bound Zero. It wasn't long before the person known as Billy Coen showed up. Capcom promised the game was also set to tell the history behind some of Resident Evil 1's mysteries, such as more about Umbrella, and what had happened to the S.T.A.R.S. Bravo Team. 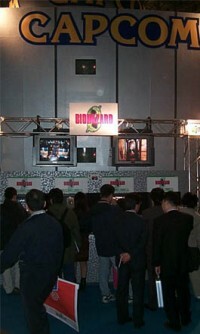 During gaming shows throughout 2000 more information was released, and playable versions shown. At both the the Spring Tokyo Games Show and E3 of 2000, a playable demo was shown allowing attendee's of a train section of the game. The demo, coming from an apparent "20% complete game" showed a small amount of use of the drop system. At the time the much touted partner zapping was missing, but both Rebecca and Billy searched the train. Interesting details were shown such as a member of STARS Bravo who everyone could only guess was Edward Dewey. However after the E3 2000 the information coming in on Zero basically started to stop, slowly fading from trailers from E3 and commercials, to a possible September release in Japan, to nothing at all. Again, as what had happened with the 1.5. version of Resident Evil 2, everything went quiet. Rumors started spreading a couple of months later of the game moving console or even being canceled. And dead it stayed until September of 2001, slightly before the Winter Tokyo Games Show that Capcom finally made an announcement. Resident Evil Zero as it was on the Nintendo 64 was to be scrapped for the game to be moved to the upcoming Nintendo Gamecube console. The Nintendo 64 version, according to Zero's producer, was well into production even though it had faced several delays. The team also realized that one cartridge wasn't going to be enough and that increasing it to more than one would be costly. It was then that choice to move to the Gamecube was made. The games earlier section doesn't seem have changed much in the way of content in the switch of consoles (as you'll be able to compare eventually with the final game and the screenshots of the N64) version, however graphically the game has been given a major overhaul. For more screenshots of the Nintendo 64 version of Resident Evil Zero check the screenshots section linked above to the left. The screens are located in the last two pages of the Zero screenshots gallery. Many thanks to Wesker and Umbrella Corp. Agent from Biohazard France in their help with Resident Evil Zero media for this small introductory feature on the N64 game.